The smart thing to do – as soon as you clear the passport queue on arrival in Malaysia – is to jump head-first into Malaysia's food scene. And the best place to start? Ordering a bowlful of laksa and eating it to the dregs. You don't have to be a foodie to realize that laksa is a Malaysian original: many first-time tasters confirm this impression by readily ordering a second bowl of this tangy, spicy, wholesome Malaysian noodle dish. Laksa is one of those unique dishes, possibly hard to find at home, that people crave long after their Southeast Asia suntan fades to a fond memory. But What, Exactly, is Laksa? Sour, spicy, slightly sweet with a hint of fish – laksa is a mouth watering noodle soup dish found all over Southeast Asia. Though the epicenter may be Malaysia, laksa's fame has spread throughout Singapore, Cambodia, Indonesia, and the West. Laksa typically consists of rice noodles in a thick, gritty gravy made from either coconut milk and curry paste or tamarind fruit and fish, depending on the locale. Lemongrass, garlic, shallots, chili, fish or shrimp, and a long list of other seasonings blend flawlessly for a complex taste. Optional lime helps to counter the fishy taste and adds a citrus zing. Laksa is the quintessential fusion of Chinese and Malay cuisine; a must-try for any traveler in Southeast Asia. Where did Laksa Come From? Laksa is generally thought to be a creation of the Chinese who immigrated to the British Straits in Malaysia during the 15th century. Known as the Peranakan, most of the immigrants were of Hokkien descent and came from South China. Even the origin of the word "laksa" is debated. The word lakhshah denotes a type of noodle in Hindi; however, laksa sounds similar to a Chinese word meaning "spicy sand" - fitting because of laksa's gritty texture. Sometimes confusing, two primary variations of laksa have evolved: curry laksa and asam laksa. Although similar in many ways, the primary difference is the stock. Curry laksa uses coconut milk as a base, providing a richer, sweeter broth while asam laksa is based on sour tamarind paste. Curry laksa is frequently topped with prawns and thin slices of hard-boiled egg. Curry laksa is often called curry mee, kari mee, or just "curry noodles" in Penang to differentiate it. Simply asking for "laksa" in Penang will usually result in a bowl of asam laksa. While asam laksa normally uses thick rice noodles, curry mee is often made with yellow spaghetti-sized noodles or even thinner vermicelli known as mee hoon. Squeamish eaters should be aware that congealed pork blood and sometimes lard is added to curry mee to thicken the gravy. Laksa has been lovingly adapted and modified from region to region. 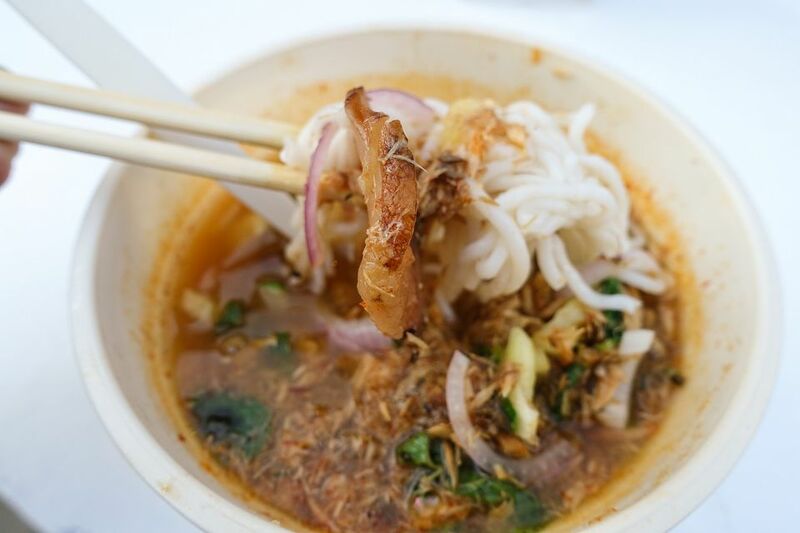 Laksa can even vary between street carts and eateries in the same town, depending on the ancestry and preference of the chef! Regardless of what word precedes or follows laksa on a menu, chances are that you will not be disappointed. Laksa Sarawak: Hailing from Kuching in Borneo and fishier than most, the Sarawak variety of laksa does not use curry. Sambal belacan – a spicy shrimp paste – serves as the base. Read more about food in Kuching. Asam Laksa: Also called Penang laksa, Asam laksa is made sour by tamarind and uses pounded or shredded fish as a base rather than shrimp paste. Asam laksa is the tasty default in the foodie hotspot city Penang. Read more about Penang food. Laksa Lemak: Rich and sweet rather than sour, laksa lemak is based on coconut milk and curry paste. Indian spices and chili make laksa lemak a popular favorite in Malaysia. Katong Laksa: Popular in Singapore, katong laksa contains chopped up noodles so that it may be eaten on the go with a plastic spoon. Katong laksa is usually topped with a hard-boiled egg slices and prawns. You'll find laksa as the basis for menus created by some of Southeast Asia's street food masters. While true laksa contains a myriad of ingredients, the job of cooking it is made easier by purchasing laksa paste. Laksa paste is available in international grocery stores as well as shops all around Southeast Asia. Boil your choice of rice noodles until half done, rinse with cold water, and set aside. Warm peanut oil in a wok, then stir in the laksa paste. Once the paste has diffused, add coconut milk and simmer for 10 minutes or until thick. Mix in the rice noodles and prawns, shredded fish, or tofu. Cook for five minutes or until the seafood is thoroughly done. Add your choices of garnish; typical enhancements frequently include: bean sprouts, lime juice, shallots, and basil leaves. Add two thin slices of a hard-boiled egg to the top of each bowl. Laksa is certainly one of the ten dishes you should try in neighboring Singapore.